The dark green Yamaha TSX-B72 Desktop Audio System is a compact audio system that supports Bluetooth wireless as well as NFC touch-to-pair technology. You can listen to local programming on AM/FM radio, or connect an audio device to the aux input. No matter what the source, SR-Bass technology ensures full-range audio with deep bass. The system also features a top-panel USB port for charging. Choose from multiple alarm options, and utilize a free app to command the alarm functions and sound playback from a mobile device. Box Dimensions (LxWxH) 10.1 x 7.8 x 6.6"
TSX-B72 Desktop Audio System (Dark Green) is rated 4.3 out of 5 by 18. Rated 5 out of 5 by Stuart from Yamaha - well manufactured Bought for my daughter who loves the CBC (Canada's public radio) and streaming from her iPad. She's a techie and loves the Yamaha Desktop Audio System. I tested it out and it is well-constructed and sounds fine with two small speakers for the high end, and a slightly bigger, bottom-mounted speaker for bass. No reports back yet about the app that controls some remote functions, but there are few radio systems like this on the market (Tivoli's equivalent has a manual tuner that tends to drift, but puts out more base) and is worth the price if you're looking for Bluetooth, FM listening, alarm function (which was not important for us) and a well-manufactured electronic device. Rated 4 out of 5 by Westlion from Great sound for size Bluetooth capability makes all the difference in this nice looking compact retro look unit. You must have a smartphone that syncs with the radio or you will have no control over the bass, treble, or midrange control of sound. Fm reception is almost nonexistent and the flimsy FM antenna is for sure an afterthought by Yamaha. I stream music and play YouTube. Video on my android and awesome sound from this unit. I like it. Rated 4 out of 5 by Mike Hoffman - Crosscut Band from Great Sound - Just okay radio tuner I bought this unit mainly to replace an aging Panasonic alarm/radio. I considered others by Tivoli, Sangean, and even the Bose Wave. For the money, this is a great little unit. The sound quality is excellent from such a small box. The radio tuner is the typical digital tuner found on most consumer radios these days. It will never be as good as Tivoli or Sangean, but the alarm is a secondary item on those units, and that's what I needed the most. There are some cool features to this unit like the IntellAlarm that lets you customize the alarm times and volume by day of the week, but you need an app and bluetooth connection to access them. It would have been nice to include those features from the panel. The bluetooth streaming works pretty well. I streamed music from my tablet in the next room and the sound was very clear with no drop-outs. If you are buying a desktop sound system as your primary audio system for your home, you might do better with Tivoli, Sangean or Bose. 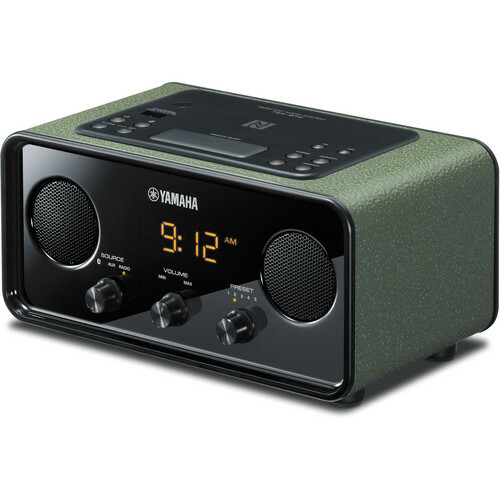 If you need a functional alarm clock radio that happens to sound great, I highly recommend the Yamaha TSX-B72. Rated 4 out of 5 by Ben from Not your average alarm clock I don't typically write reviews, but this little alarm clock radio was so great I felt compelled to share it with the world!Look and FeelOut of the box, the finish is very nice and the unit is quite stylish. Build quality feels solid. Dials are smooth and buttons are easy to use.ClockIt's just a clock, but I like sleeping in the dark and hate alarms with bright screens. This unit has an ambient light sensor that dims the screen (which is not overly bright to begin with) when the lights go down.AudioSound quality is good, but doesn't blow me away. I'm far from an audiophile, but the best way to describe it is that the music doesn't really fill the room. Bass is also pretty decent and the app allows you to adjust the equalizer manually which I appreciate - I turn the bass way down in the morning so I don't wake up to bed rattling music.InputsFM radio reception is better than my old alarm clock but can still be a bit fuzzy sometimes unless I fully extend the antenna which is ugly. Note I live in a big concrete apartment building facing away from the broadcast tower in our city and I've always had this issue with radios. This is the best unit I've had so far, but not perfect.Bluetooth connectivity is really handy although in the last two days I've used the unit it did drop out once.AlarmDisappointed this unit doesn't have two timed alarms. Ie, set an initial alarm for music and a second one with loud beeping 20 minutes later if I'm still in bed. Also, it will save the time if you have a brief power outage, but there is no battery backup for the alarm.AppThe iPhone app is great and allows you to control virtually any functionality on the unit. Very nice touch.Overall a very versatile unit which is great as a multipurpose alarm clock. At $$, it's a little pricey given a few of the shortcomings listed above, but still very impressive (and the best one I've found so far). Rated 5 out of 5 by Happy in Detroit from Mom has turned off the TV! My mother in law recently moved into an apartment and is living alone for first time in her life. She used the TV for company. Since we placed her red audio system in the kitchen she listens to classical music. She is calmer and singing! Ordering and delivery were a breeze. Just a delightful experience all around. Rated 5 out of 5 by William G from Top Notch Sound and Smartphone Integration Excellent alarm-clock-radio. This replaced an HD radio I'd had for several years and can't hear much difference in casual listening. Once I got the bluetooth sync figured out (it took a couple of tries) everything else was a breeze. Great range of tone (Low-to-High freq range) can be tuned easily with the smartphone app's graphic equalizer settings. Likewise, setting up any combination of alarms and wake-up station and preferred volume is super simple with the app; each day of the week Mon-Sun can have a different time/station/volume combination. Initially thought that only 5 pre-set stations per band might be limiting... but not so much so with the app in my hand. Delighted that I can stream my mobile's Google and Spotify playlists as well. Rated 2 out of 5 by William from Lacking There is no physical tone adjustment on this unit. Tone adjusting is via app. The android and ios apps are finicky and tedious to use. There is no snooze adjustment! You are stuck with 5 minutes snooze period! When using Bluetooth, manual volume adjustment on the unit is required both before and after Bluetooth use. That is, if normal radio volume is 20 on a 1-60 scale, then when you go to Bluetooth operation, in order to hear at the same level, you have to adjust the dial on the radio to at 40 or so to hear. The reverse is required when returning to radio or aux operation. Bluetooth input device volume setting does not seem to raise the volume enough by itself. The sound quality is good except for the overbearing bass which you have to adjust down via app as explained earlier. The unit is attractive to look at and compact enough for the nightstand. Rated 5 out of 5 by Sam from Yamaha desktop audio system This system was purchased to place in our kitchen and we definitely made the right choice. The compact size is just what we needed and the dark red color blends in perfectly with our color scheme. The display is very clear and easy to read and the sound is great. Does this unit have an alarm backup battery? This device offers no battery back-up features. what is the voltage of this device? 110 V AC 60 Hz. I am sorry. These stations and frequencies are not available. Does the power cord have a transformer at the plug to convert to low voltage? Yes, it has a separate power supply. Great radio. I see nothing about the tuner, when the radio is on does it display the channel it is tuned to?the presets when one selected does it display that channel?is there a way to toggle between the display of time and channel? Question 1 Yes when you turn on the radio it shows the chosen preset channel them it refers back to the time.Question 2 Yes, then goes back to the time display Question 3 YesThis is a very good clock radio, but be aware that it displays only a 24 hour clock. 8:00 pm is 20:00 hrs. What we would refer to as Military Time.Also when you setup the alarm - when you press down on the alarm set button it shows the alarm time and then goes back to the time with a indication that the alarm is on.The aux also works very well. For a clock radio it works very well. Does this radio play AM radio? The manual makes no mention of it but this unit is described as an AM/FM player on the BH website, and there does appear to be no switch on the unit that toggles between them. What is the voltage of power supple? Is 220v available? I bought this radio as a present for my dad who lives in Nepal. They have 220v there. And the radio works fantastic. He loves the sound of it.This radio comes with external power adaptor like a laptop. This adaptor is good for both 110 and 220v.Hope this helps. does this have Aux in? Yes, there an auxiliary input in the back. This is a wonderful radio and clock.